The Bowflex PR1000 Home Gym is an ideal product if you are looking for a complete workout without having to leave your home. We found Amazon.com is offering a 31% discount on Bowflex PR1000 home gym. Click here to check it out. The Bowflex Home Gym gives you a complete workout due to its unique style and the tons of features it has. This product is ideal for home use as it allows you to give your body a strength workout without having to go out to the gym. The PR1000 home gym allows people to give their bodies 30 different strength workouts and it also has a built-in rowing station. 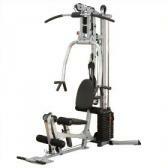 With the PR1000 home gym you can easily work your arms, chest, abs, back, shoulders and lower body. Get 31% Off + Free Delivery on Amazon Now! The Bowflex PR1000 home gym features triple-function hand grips for lat pull-down. It also features a horizontal bench press. You can also do leg extensions and leg curl exercises as the PR1000 features four-inch upholstered roller cushions. 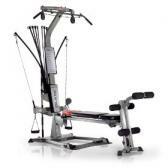 The rowing machine system featured in the PR1000 is ideal for great arm strength workout. The Power Rods featured in the Bowfelx PR1000 home gym are patented and they provide resistance, or weight. This feels just as good as free weights but it doesn’t have the inertia or the risk of joint pain that comes with using free weights. You can go from 5 pounds to 210 pounds of resistance by hooking one, two, three or all of the Power Rods to the cable pulley system and give yourself the desired level of workout. 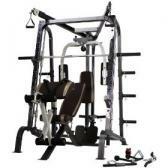 All of the parts in the Bowflex PR1000 home gym are manufactured form high grade composite material. All of these parts are then run through different tests to see the durability and the quality. The Power Rods are capable of being flexed numerous times without wearing out. The height of the PR1000 is 81 inches and the length is 84 Inches. The maximum user weight that the PR1000 can handle is 300 pounds. The Bowflex PR1000 takes up a 100 by 78 inches workout place. This product also features workout placard that displays workout references so that you can work out easily with this product. As I did my research regarding the Bowflex PR1000 home gym I came across a lot of positive customer reviews for this product. This doesn’t come as a surprise as Bowflex has always given its customers products that cater to their every exercising need. The average rating of the Bowflex home gym is four and a half stars on Amazon.com. Click here to read more reviews. The customer reviews received by the Bowflex PR1000 are 340 in number on Amazon.com alone and all of them have nothing but praise for this unique exercising product. Many of the customers have praised the fact that the PR1000 allows them to do more than thirty different exercises and they don’t have to go to the gym anymore. 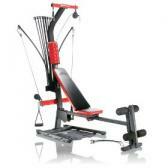 The customers have also liked that the Bowflex PR1000 home gym is very easy to assemble and use. This might sound hard to believe but during my research came across only one or two negative customer reviews regarding the PR1000 home gym. If one is to compare these reviews, the negative ones seem negligible when compared to the immense positive reviews the PR1000 home gym has received. Thus, in the end I would like to recommend the Bowflex PR1000 home gym to all of you who want to have a nice workout right at your home. 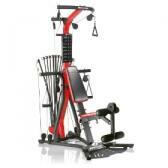 Click here to SAVE $244.95 on the Bowflex PR1000 for a limited time only! How would you rate the "Bowflex PR1000 Home Gym"?